anyway - on they plod. i markered around the pink spots, which seem to have been contained. there may have been a few temp fluctuations to explain the growth spurt lines. Those are some questionable jars of spawn. In the future I would use less substrate in each jar, half of what you have there. With those jars I wouldn't spawn STERILE/Pasteurized substrate. I would sandwich the colonized substrate between a bottom layer of bagged soil and then some bagged cow manure then the spawn then a layer of bagged manure then some more bagged soil on top. Keep it in the open air, not in a fruiting chamber, and keep the top layer moist. Use thin layers of manure/ soil, and a thick layer of spawn!!! This technique woks well with questionable spawn(contamination). Won't produce enormous flushes, but it is better then potentially spawning alot of manure with contamination. The Birdseed should produce some mushrooms all on it's own, if you want to omit the manure. Just sandwich between two layers of good potting soil, and keep moist, not wet!! The key is open air, and non-sterile casing materials. thank you, Teonan! I have long been an admirer of your work, and these tips are gold dust to me. I do not have any 'bagged' manure, just a few kilos of dried out horse dung. i was intrigued by your advice to grow in the open rather than in a chamber, but will be following your advice as closely as i can. it's a pretty disappointing project so far, but i'm enjoying it as much as ever. even a failed attempt (and it's not over til the fat lady sings) teaches many new lessons. uh-oh. why is that fat lady getting that microphone out? That will work. The IMPORTANT THING is to not paseurize/sterilize the stuff first. And fruit it in the open air, just misting to rehydrate the surface of the casing. Just make sure you bring the manure and the soil up to field capacity moisture content before building the layers. I have obtained a few small fruits off of VERY contaminated spawn this way. It was better for me then just tossing the stuff. And if it really isn't to contaminated, you could get more then a few. This method is essentially the same as dumping old casings and contaminated spawn into the garden, and getting a few fruits. Except you can use a small rubbermaid, and leave it on a table in your room!! I live in a condo, so I have no backyard garden to toss the stuff into, so I gave this a try and it worked. Just use a small enough rubbermaid so that the very top of the completed casing is almost even with the top of the rubbermaid. You don't want any stagnant air on the surface of the casing. casing tub, up to the top, on table? no tub outside it at all? rubbermaid is the casing tub. filled to the brim, sitting on the table ? and should i rig up the fishtank tubing to aim at it like a little waterfall, for continuous air exchange? have i got this right? please explain one more time for this thicko, who is caught up in the concepts i have used in the past! >hopefully the cats wouldn't try to use it as a toilet! 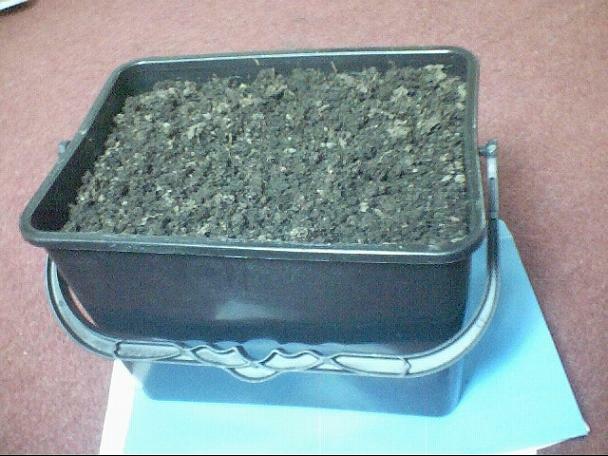 Bottom layer of non-sterile bagged potting soil. Layer of spawn on top of that. Layer of manure on top of that. (non sterile) and very thin. Optional. Layer of non-sterile bagged potting soil. All of these layers should bring you within the top 1/8 inch of the surface of the 4 quart tub. All layers should be at the proper moisture content. You want no HIGH humidity environmnet at the surface of the soil, other then misting manually with a spray bottle, and only when it appears to be getting dry. Essentially you are replacing the moisture of the top casing soil only. If you were to surround this in another rubbermaid, you would create an environmnet that favors CONTAMINATION. Remember that the NORMAL methods of fruiting in clean substrates is EXCLUSIONARY. There are no contaminants present. If there are, that is why they spread so rapidly. Pins are not going to be forming at the surface of the casing with the salvage method, they will be coming from beneath the soil surface, and braking through the top. So manintaing absolute ideal conditions at the surface of the casing is counter productive. Ideal conditions will favor contaminants, not mushrooms at the surface layer. Yes if you have cats they might mistake it for a toilet, so EXCLUDE them from the room!!! When building the layers, make sure your spawn layer is completely surrounded on all sides by the casing layers. I.E, don't lay the spawn out so it's layer reaches the sides of the rubbermaid. Similar to adding alittle more substrate after spawning a bulk casing to the surface to not have any of the spawn exposed, post innoculation, prior to colonization. This was just a suggestion, that has worked for me in similar situations. Situatins were I did not feel comfortable with the appearance of jars of spawn, and did not want to toss the spawn that I had no duplicates prepared. thank you teonan for taking the time to write this. it is greatly appreciated. 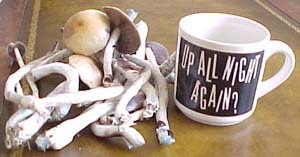 if you ever need anything in return that i can help with, i'll be sure to pitch in (obviously it won't be to do with mushroom cultivation!). you may pick up on my strange and pitiful areas of knowledge in the occasional post - pm any specific queries, and i'll trade wisdom for wisdom! i owe you one. Fascism (fash'izem) n. A governmental system marked by a centralized dictatorship, stringent socioeconomic controls, and often belligerent nationalism. see also: the Bush Administration. well, in case anyone wondered, the update situation isn't good that fat lady showed up, and she can really hit the high notes. Yeah, don't be down Shirl! Those pans are more difficult than cubes. Definately give it another shot, and keep your head up. Your doing great! 31,509 topic views. 0 members, 0 guests and 0 web crawlers are browsing this forum. Generated in 0.03 seconds spending 0.007 seconds on 20 queries.